What are pancreas divisum symptoms? How is pancreas divisum diagnosed? What is the treatment for pancreas divisum? What is the prognosis for pancreas divisum? 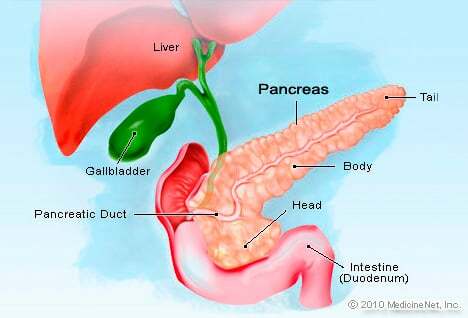 Pancreas divisum is a common congenital anomaly (an anomaly that is present at birth) of the pancreatic duct(s). The pancreas is a deep-seated organ located behind the stomach. One of its functions is to produce enzymes that are important for the digestion of food in the intestine. The digestive enzymes, in the form of digestive juice, drain from the pancreas via the pancreatic duct into the duodenum (the uppermost portion of the small intestine) where they aid in digesting food. The human embryo starts life with a pancreas that is in two parts, each with its own duct; the ventral duct and the dorsal duct. The two parts of the pancreas fuse during development. In most embryos, the dorsal and the ventral ducts also will fuse to form one main pancreatic duct. The main pancreatic duct will join the common bile duct (the duct that drains bile from the gallbladder and the liver) to form a common bile and pancreatic duct which drains into the duodenum through the major papilla. In some embryos, the dorsal and the ventral ducts fail to fuse. Failure of the ventral and the dorsal pancreatic ducts to fuse is called pancreas divisum (because the pancreas is drained by two ducts). In pancreas divisum, the ventral duct drains into the major papilla, while the dorsal duct drains into a separate minor papilla. Most individuals born with pancreas divisum experience no symptoms throughout life, will remain undiagnosed, and will not require treatment. A small number of patients with pancreas divisum will experience repeated episodes of pancreatitis. Pancreatitis is an inflammation of the pancreas that can cause abdominal pain as well as more severe complications. Some patients with pancreas divisum may develop chronic abdominal pain without pancreatitis. Doctors are not certain how pancreas divisum causes abdominal pain and pancreatitis. One theory is that the minor papilla is too narrow to adequately drain the digestive juices in the dorsal portion of the pancreas. The backup of the digestive juices elevates the pressure in the minor duct that causes abdominal pain and pancreatitis. Others believe that there must be other factors above and beyond the anatomic anomaly of pancreas divisum that predispose a certain population of patients to develop pancreatitis. Research continues in order to determine the exact relationship. The most accurate test to diagnose pancreas divisum is ERCP (endoscopic retrograde cholangio-pancreatography), which can demonstrate the presence of two separately draining pancreatic ducts. However, ERCP itself sometimes can cause attacks of pancreatitis. Other tests that can help diagnose pancreas divisum without the risk of causing pancreatitis include endoscopic ultrasound (EUS), and MRI (magnetic resonance imaging). Pancreas divisum without symptoms needs no treatment. Treatment of patients with abdominal pain and recurrent pancreatitis attributable to pancreas divisum has not been well established. Some doctors will attempt sphincterotomy (cutting of the minor papilla during ERCP to enlarge its opening). Others will insert a stent during ERCP into the duct to prevent duct blockage. These procedures are not risk free. Therefore, patients with symptomatic pancreas divisum are best evaluated and treated by doctors in centers experienced in treating pancreatic diseases. Most patients with pancreas divisum remain asymptomatic and therefore the prognosis is excellent. For those patients with symptoms of pancreatitis, the prognosis is no different than that of the unaffected population who develop pancreatitis. Even after treatment, pancreatitis may recur. It is important to remember that there is no clear evidence to support a causal relationship between pancreas divisum and pancreatitis. Previous contributing author: Dennis Lee, MD. What were your symptoms associated with pancreas divisum? What kinds of treatment or surgery have you received for your pancreas divisum? Oral digestive enzymes are found in the digestive tract, are naturally produced by the body, and help breakdown the foods we eat. The pancreas makes and secretes digestive enzymes. Prescription and OTC digestive enzymes are available in PEPs or pancreatic enzyme products. PEPs are prescribed for people with cystic fibrosis, chronic pancreatitis, pancreatic cancer or tumors, Shwachman-Diamond syndrome, or removal of part or all of the pancreas. Side effects, drug interactions, dosing, storage, and pregnancy and breastfeeding information should be reviewed prior to taking any medication.